The VPM uses Regional Price Parities published by the Bureau of Economic Analysis for its cost of living adjustments across geography. These price parities are similar to the Consumer Price Index (CPI), but instead of adjusting dollar values across time, the price parities adjust values across geographic regions. The price parities are indexed on the national average which is given a value of 100. Regions with index values above 100 have greater costs of living while those that have values less than 100 experience costs below the national average. These alternative ways of measuring poverty provide surprising insights into the true population in economic distress. Using them in place of the official poverty measure for certain types of funding allocation schemes or benefit calculations could prove to be a more efficient and effective use of tax dollars. 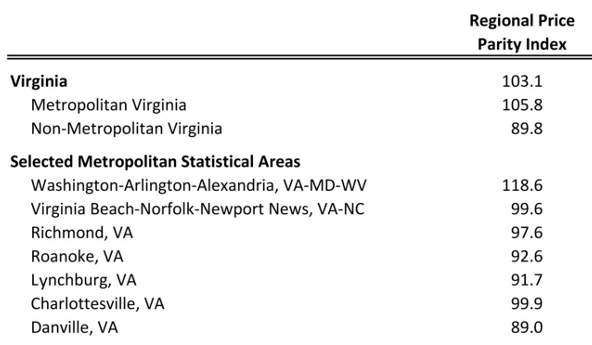 The Census Bureau stresses that its new SPM, that uses geographic adjustments, is for research purposes only. However, I hope this kind of research and state experimentation in alternative poverty measures, like the VPM and similar projects in Wisconsin and New York City, lead to replacing the official measure with something that conforms to common sense and better reflects the economic realities of different places.